Hopefully we won’t need another world war to get us out of the fix we’re in today. Fortunately, we are in the early stages of a crisis, and downward momentum has not yet set in. By the time Keynes devised his theory, the Great Depression had been going on for six years, and it took a great deal more effort to get the economy out of the deep hole it was in than it would have had the right course been followed when the crisis started. We also have the advantage of important institutions like deposit insurance and much better leadership at the Fed. But in the end, there is a limit to what the Fed can do by itself. At some point, government spending must be the engine that pulls the economy out of recession, because only that can compensate for the fall in private spending that has caused velocity to drop and brought on deflationary conditions. But it must be the right kind of spending. It must draw real resources out of the economy–that is the only kind of spending that will work. Buying bad mortgages and sending out more rebate checks won’t do any good. 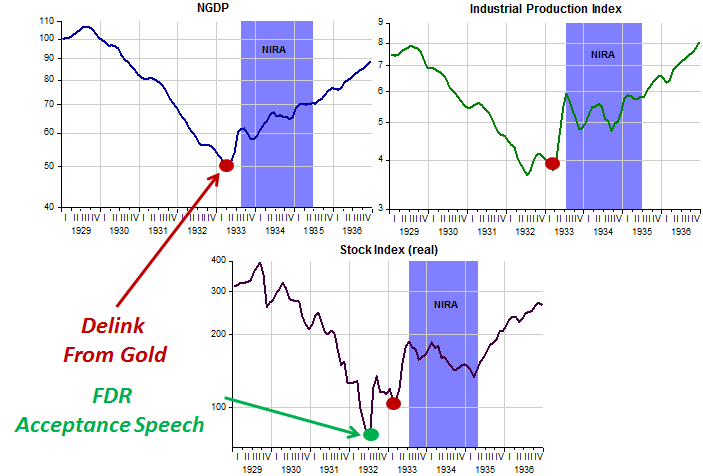 The charts clearly show that in the 1930s it was monetary policy (FDR´s decision to delink from gold) that reversed the trend (the stock market had done a turn-about at the time of FDR´s acceptance speech in July 1932). And the following chart puts a dent in Bartlett´s argument for the “rescuing capacity” of government purchases (real government consumption & investment spending). Strongly rising government purchases didn´t stop the economy from plunging hard from mid-2008 to mid-2009 (the deepest fall in the post war period). 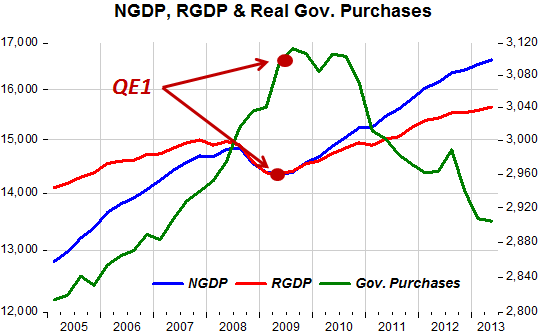 Also, the steep drop in government purchases didn´t stop the economy from gaining some traction. QE1 brought on a moderately expansionary monetary policy, which was just enough to reverse the economy´s trend (but far short of what was needed to get it back to any reasonable trend level). Once again, the views of Friedman beat those of Keynes.